Here’s what’s up in the world of TV for Tuesday, May 30. All times are Eastern. House Of Cards (Netflix): Remember what it was like when Frank Underwood was the most terrifying political figure you could name? Ah, those were the days. 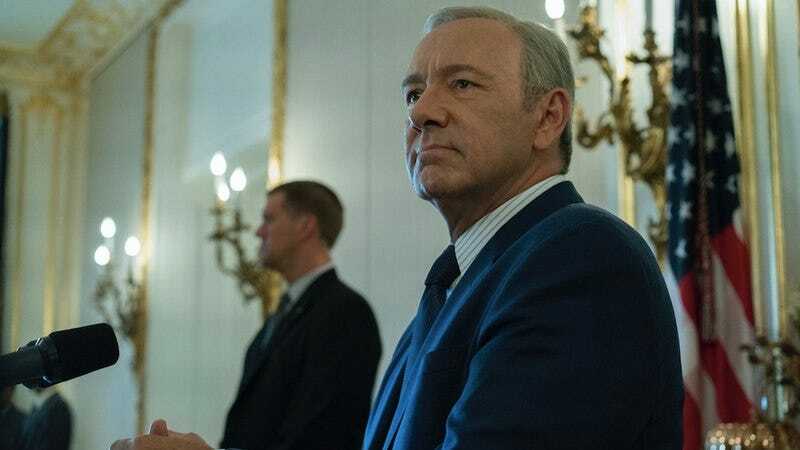 So let’s welcome back House Of Cards for its fifth season, as we discover whether Frank actually maintains his hold on the presidency alongside his running mate Claire. The Americans (FX, 10 p.m.): After ending last week’s episode on a devastating cliffhanger, The American closes out its penultimate season. Will the Jennings go back home? Or is their fate tied to the country they are fighting against? Sarah Silverman: A Speck Of Dust (Netflix): Sarah Silverman does her own Netflix special thing this week, and if the promo is any indication it’s going to be just as dirty as you’d hope it would be.